The 1981 Italian Grand Prix was a Formula One motor race held at Monza on 13 September 1981. Formula One returned to the Monza circuit after a year's absence; the previous Italian Grand Prix had been held at the Imola circuit. Coming into Italy, both Nelson Piquet and Carlos Reutemann were tied on points in the Drivers' Championship; Reutemann would eventually leave with the lead. Alain Prost was also becoming a challenger for the world title, having been challenging both leaders in the recent races. The race would be known for the first time a Toleman qualified and finished in a race, with Brian Henton qualifying the car in 23rd place. After a year away from Formula One in 1980, Monza returned to the Formula One circus in its usual place as the Italian Grand Prix. There was continued change at Tyrrell, the team were trialling Goodyear tyres on Eddie Cheever's car for Italy whilst Michele Alboreto continued to run on Avon rubber. With three rounds to go the championship fight was looking much more intense. Carlos Reutemann and Nelson Piquet jointly led the championship on 45 points whilst eleven points behind was Jacques Laffite in third. Alan Jones in the second Williams was fourth, three points behind Laffite whilst three points behind Jones with a very slim chance at the title was Alain Prost. Prost and Renault had proven to be the fastest pairing on the grid in the second half of the season, only poor reliability had prevented him from being closer in the championship and adding to his two wins. Nonetheless Renault were once again predicted to be the fastest team on the grid. After McLaren had refused to allow its driver Andrea de Cesaris to race in Zandvoort due to his consistent performance in destroying the team's cars, there was much speculation leading to the idea that De Cesaris had been sacked. Fortunately for the young Italian, the team had agreed to continue racing with him until the end of the season, although it was more than likely that De Cesaris would be forced to find a new drive for 1982 especially considering Niki Lauda was rumoured to be returning to F1 with the team. The Renault's were once again quick in practice, however they did not completely lock out the front row of the grid as Carlos Reutemann managed to put his Williams in between pole sitter René Arnoux and recent race winner Alain Prost. Thereafter came the other championship contenders of Laffite, Jones and Piquet. At the back half of the top ten was John Watson and the two Ferraris of Didier Pironi and Gilles Villeneuve. Siegfried Stohr had an enormous accident in qualifying, destroying his Arrows in the process, Stohr exited the wreckage badly shaken but otherwise unscathed. Brian Henton managed to qualify in 23rd place, finally giving the newly formed Toleman team an opportunity to perform in the race. Henton would be starting his first F1 race since the 1977 United States Grand Prix West. At the start Arnoux overtook Reutemann in the run down to turn one as Prost led away. Reutemann retook second place from Arnoux heading into turn three. Didier Pironi made an excellent start from eighth on the grid, moving into fourth by the first corner much to the delight of the Tifosi. By the end of the lap, Pironi had moved his Ferrari past Arnoux and Reutemann to take second. Reutemann began to drop back, dropping behind Arnoux and Jacques Laffite. On lap five, Arnoux took second position from Pironi whilst the second Ferrari of Gilles Villeneuve retired with engine failure. Pironi began to drop back to Laffite and the two Williams cars of Reutemann and Jones. On lap 11, Eddie Cheever spun off the circuit to retire whilst Laffite also pulled out of the race with a slow puncture. A lap later, Arnoux spun off the circuit whilst trying to avoid Cheever's stricken Tyrrell, bringing an end to his race. At this time a light rain had hit the circuit adding a further challenge for the drivers. Patrick Tambay had stormed through the field, following Jones and Piquet after overtaking Pironi who continued to drop back. Reutemann was underperforming having fallen behind Pironi and John Watson's McLaren, now coming under pressure from Bruno Giacomelli's Alfa Romeo. On lap 19, Watson went wide into the second lesmo where he got caught on a kerb and spun 90 degrees and smashed into the opposing barrier. Watson's McLaren disintegrated, his car was ripped in two. The rear half of his car burst into flame as Watson's gearbox and wheels skitted across the circuit. Michele Alboreto got caught in the debris, causing enough damage to end his race. Carlos Reutemann who was following Watson was forced to take avoiding driving wide off the circuit and in doing so lost a place to Giacomelli, but nonetheless emerging unscathed. Watson remarkably emerged from the wreck unhurt, managing to walk back to the pits. Patrick Tambay who was doing well for Ligier in third retired similarly to teammate Laffite with a puncture. This put Bruno Giacomelli into third place, a rare strong performance for the Alfa Romeo in 1981. However the success was not to last as he was forced into the pits with a jammed gearbox to retire. 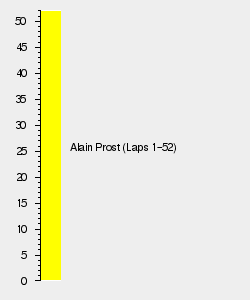 Alain Prost continued to dominate the race out front for Renault whilst Alan Jones was an unchallenged second. Nelson Piquet and Carlos Reutemann diced for third place, it did not seem likely that Reutemann could get past Piquet, however Piquet's Brabham suffered an engine failure on the final lap, crucially in the world championship allowing Reutemann to take third. Elio de Angelis took fourth position whilst Didier Pironi was fifth for Ferrari. Nelson Piquet was consoled with at least gaining a single point in sixth. Andrea de Cesaris would have finished sixth in his McLaren albeit a puncture on the final lap rendering him out of the points.